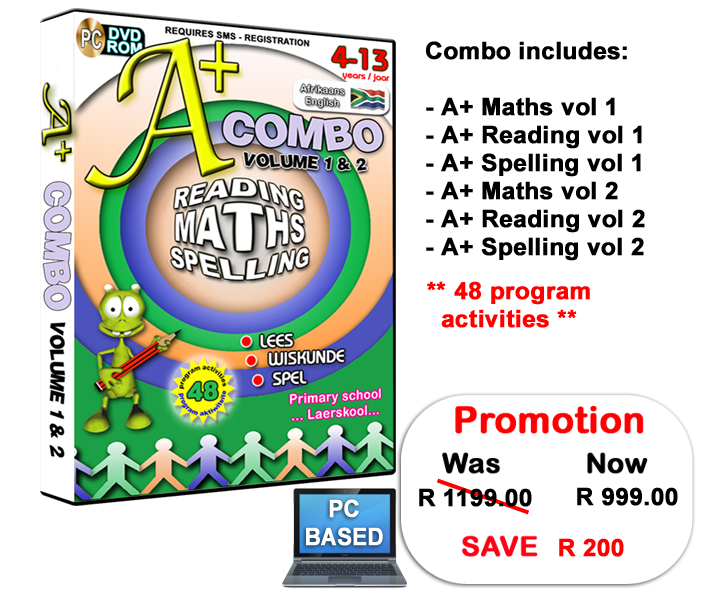 The A+ Math, Spelling and Reading combo consist of 6 individual educational software products in one convenient box. It caters for grade 1 learners up to learners in grade 7. All content is available in Afrikaans and English. Both languages are included in the combo. The individual products are also available as stand-alone products but you will save money when buying the A+ Combo product. A+ Maths vol 1 & 2 is fun-filled multimedia educational programs for primary school learners, and develops the fundamental mathematical skills in order to master advance mathematics in higher education. A+ Spelling vol 1 & 2 is interactive and fun software programs for primary school learners. The programs teach various spelling skills in several activities and contains thousands of exercises to keep children hooked for hours of fun and constructive learning. A+ Reading vol 1 & 2 provide the learner with several exercises and activities to develop and improve reading skills and will increase the learner's reading speed dramatically in a short period of time while playing.